We’d love your help. Let us know what’s wrong with this preview of Depressive Illness by Tim Cantopher. To ask other readers questions about Depressive Illness, please sign up. This book has revolutionised the way I view myself and my depression. It’s not a self-help book as such. It provides information on stress-related depression, with occasional bits of advice. There are no exercises to complete. Intead, Depressive Illness: The Curse of the Strong helps you to understand how your illness developed, why you need to be gentle with yourself and what you need to do to get better. I first developed severe depression after pushing myself too hard during my final year at un This book has revolutionised the way I view myself and my depression. I first developed severe depression after pushing myself too hard during my final year at university. For years, I thought of myself as weak. I struggled to cope with everyday life, was often too depressed to work, and I hated myself for not being able to function like a “normal” human being. Tim Cantopher turned that view of myself on its head. He argues that those who develop stress-related depression are actually hard-working, perfectionistic people with a strong work ethic who burn themselves out. This was very true of me but in the mire of negative thoughts that’s part and parcel of depression, I hadn’t been able to see it until someone else pointed it out. Before reading this book, I’d tried many CBT-based self-help books with practical exercises to complete. These were very helpful on one level – challenging negative thoughts makes a huge difference – but on another level they just fed into my perfectionism issues. I always felt like I should be doing more to fight against my depression. I pushed myself too hard and it was a vicious circle. Since reading this book I’ve completely changed my approach to depression. Cantopher advocates rest as an essential part of depression treatment. He actually recommends a wall-to-wall diet of Australian soap operas as a distraction from how you feel (not my thing, but hey). As you start to feel better and to want to get things done, he suggests leaving tasks half-finished as soon as you find yourself becoming tired. If you push yourself too far, he says, you’ll end up feeling much worse for the next 36-72 hours. Apparently a pattern of good days and bad days is normal in depression recovery, but if you overdo it on the good days, the pattern becomes exaggerated, you’ll have more bad days and take longer to recover. It literally can be a case of one step forward, four steps back. The book is not without its flaws. Firstly, Cantopher makes a lot of assumptions about the depressed reader. One of the reasons I found The Curse of the Strong so helpful is that they all applied to me, but if they don’t apply to you, you’re likely to feel pissed off, not to mention disturbed that he “almost never bother[s]” to make enquiries as to his patients’ personality because he knows it all already. Secondly, he states his own theories and beliefs about the biological side of depression as though they were undisputed scientific fact. Although this sort of thing is common within the medical model, I don’t believe there is sufficient evidence to claim that depression is a physical rather than a mental illness; nor do I believe that in almost all cases it could be diagnosed with a lumbar puncture showing reduced levels of serotonin and noradrenaline. (Surely if that were the case, LPs would be performed in cases of diagnostic doubt. I realise it’s an unpleasant and risky procedure, but then severe depression is just as unpleasant and life-threatening.) I think this is all part of Cantopher’s rhetoric to convince the reader that they are not weak or to blame for their illness, but frankly, any scientific “facts” that you come across in his book I would check elsewhere. So, my sister recommended this book to me, and I really didn't get it. Because, I wasn't depressed, was I? Obviously not. Anyway, I was halfway through the first chapter when I first realized that he was describing my life of the last few years word for word. So much information in such a small book. So, yeah. Definitely recommended for anyone who has depression, or knows anyone who has depression, or is at all interested in depression, or anyone else really. It's just that good. Please visit and 'like' FADS - the Forum for Anxiety and Depression Sufferers! Quite short, and at times a little simplistic, but a valuable book nevertheless which I shall certainly dip into many more times, just as I already read some sections several times along the way. the central thesis is that it's the very resilient people who seem to cope well with what life throws at them, seemingly without complaint, who may end up disastrously unwell when things finally reach tipping point. this certainly resonated with me. This. Book. Changed. My. Life. It's as simple as that. Seriously, everybody should read this book. I don't usually say that, but I'm saying it now! Reading something which is honest, kind and compassionate about mental illness makes a refreshing change. From understanding what depressive illness is, what causes it, how to recover to how to stay well, Cantopher gives a clear message: you are ill because you have been too strong and this is how you recover. It has helped me work through some very This. Book. Changed. My. Life. Please, everybody who knows someone with depressive illness, read the intro and chapter 1 of this book! Apparantly lots of tips for healthy people in here too. haven't gotten to that bit yet (only at chapter 4). written in easy to understand English yet informative and accurate. The only thing that really bugs me about this book is it's title. I can see it is fitting in relation to the content, however it is literally stopping me from getting copies for the people in my life whom i would really l Please, everybody who knows someone with depressive illness, read the intro and chapter 1 of this book! Apparantly lots of tips for healthy people in here too. haven't gotten to that bit yet (only at chapter 4). I bought this book after I listened to an interview of Tim Cantopher. I now have to keep track of who I have lent it to! I guess this book provides different things to different people but what I like about it is the logic and explanation to a topic that is very taboo at times. 'Stiff upper lip' and 'we all get low' was part of my upbringing; depression was not an option. I believe this book is a fabulous opportunity to start understanding depression whether you suffer or know someone who does. Excellent little book; very insightful - not only for sufferers but anyone living with someone prone to depressive episodes. Very readable, and highly recommended ! "Clinical depression is not a psychological or emotional state. It is a physical illness. Clinical depression is every bit as a physical a condition as pneumonia or a broken leg." Psychiatrist Tim Cantopher's book is one of the most motivational self-help books I have read, and has got my 2018 goal to improve my mental health off to a great start. I found the very clear, concise, direct style extremely helpful, especially as there are so many conflicted opinions and a lot of personal guilt surrou "Clinical depression is not a psychological or emotional state. It is a physical illness. Clinical depression is every bit as a physical a condition as pneumonia or a broken leg." Psychiatrist Tim Cantopher's book is one of the most motivational self-help books I have read, and has got my 2018 goal to improve my mental health off to a great start. I found the very clear, concise, direct style extremely helpful, especially as there are so many conflicted opinions and a lot of personal guilt surrounding depression. The author is clear in recognising the internal strength of character of those who put so much into their lives that their mental health begins to suffer (Cantopher is clear from the start that he is discussing stress-induced depression, rather than depression linked to other life circumstances for which this may be less relevant). "This person is usually someone who is admired, if somewhat taken for granted by those around them. People are usually very surprised when they get ill; in fact, they are the last person you would expect to have a breakdown." The author frequently uses the metaphor of a fuse blowing to describe the onset of depression, "You need to respond to adversity with strength and resilience in order for the fuse to blow." Here, he stresses that the sufferer is determined and capable, which gives them the tools to combat the illness. I found this approach, which identified positive as well as harmful aspects of suffers' personality which contribute to depression as empowering. The illness is less overwhelming when seen within the context of a person's life as a whole. The book contained a lot of helpful life-advice relevant to people with depression, their relatives, or just the population more generally. A personal favourite: "People with the strongest opinions are often those with the least knowledge, as once you consider any issue seriously, you often find that it defies a categorical opinion one way or the other." Another is his emphasis on learning through mistakes, and not demanding excessively high standards of yourself in everything you do. "what's really hard but correspondingly rewarding is to fail well." I also found it rewarding to have the author so clearly debunk the 'just pull yourself together and get on with it' advice, which is often offered by non-professionals who think they understand. "No you haven't, so stop making things worse with your ill-informed advice." Here, it really helped to have the authoritative voice of a clinician adding some weight and certainty behind the advice. At the heart of this book is the personality of profiling of the depressed patient as someone who has had a lot to cope with in life and soldiered on without help for too. I found this intensely relatable, which helps with the feelings of isolation that often come along with depression. Each of the psychodynamic theories behind depression really spoke to me, from the 'superego' corrective voice of the harsh critical parent leading to the sufferer "overloaded with inhibition and self-reproach", repressed anger as a natural response to childhood trauma "people who suffer adversity learn at a tender age how to do this", lack of parental input leading to "no real choice but to withdraw inside herself", and learned helplessness as a result of childhood inconsistency. I think each of these threads makes sense of some aspect of my subconscious, and hopefully I can get more out of counselling sessions with this background. Another really important aspect of this book was the focus on how to maintain and manage the recovery process. Many other self-help books discuss getting out of the acute phase of depression, but relatively few give warnings about the expected fluctuations in mood during recovery, or the key areas of lifestyle change which separate patients who go on to recover long-term from those who relapse. It really assuaged my guilt to hear the author's stance on those who continue to put others first and work extremely hard during their recovery. "If this is you, then I'm sorry, but you're choosing illness." The author has a lot of faith in the patient, which sufferers often don't have in themselves during depression. But this confidence in prioritising the self, and listening to the body for cues on how best to treat the mind, removes a lot of the tension from managing recovery. "How much can you do at any particular point in the recovery process? The truth is, I don't have the faintest idea, but you do because your body tell you." I think I will definitely return to this book when my self-esteem is low and my confidence in my own decisions diminished. The sense I took away from this book overall was empowerment, something I had never felt before as a depressed person. Depressive Illness – The Curse of the Strong is a best selling book all about depression by Psychiatrist Dr Tim Cantopher. This book is outstanding. Every aspect of the book has been created with a reader who is struggling with depression in mind. This book is written as if the author is having a conversation with the reader. The book is short, a total of 114 pages, as are the chapters, which is intentional as a symptom of depression is having a limited concentration span. The short chapters mean that the book is easy to dip in and out of. Depressive Illness covers a lot and doesn’t waste a single word. - What depression really is and the historic diagnosis and treatment of depression. - What the clinical research around depression says. - Managing and treatment options for depression. - Recovery and staying well in the future. - The politics of depression – why we as a society need to be more open, honest and have dialogue about it. Cantopher’s believes that if you have done too much, been too strong and tried too hard for too long it will lead to clinical depression. This isn’t a failing in the person, in fact quite the opposite. It’s a wonder that anyone can be so strong for so long. This approach is very empowering for the individual with depression and very true to real life. It is often those that just keep going, those that are there for everyone else who eventually burn out and find themselves in the unpleasant land of clinical depression. I read this book during a severe episode of clinical depression and was able to do so, by using the chapters to do little and often. Depressive Illness – The Curse of the Strong is an essential book around clinical depression and should be read by all those interested in mental health and mental illness. For health professionals – particularly in the mental health and illness field this book should be required reading. 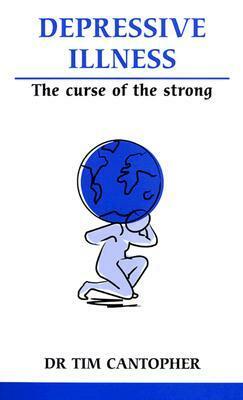 Depressive Illness – The Curse of the Strong is available to buy on Amazon and able to be ordered at all good book shops. I am going through a depressive episode at the moment & this book was recommended to me by my therapist. It is not a long book but it is packed full of good advice which is easily digested. I am going to re-read a number of its chapters on a regular basis since they are full of good sense. The central contention of the book is that depressive illness brought on by stress is not a condition that afflicts the weak or disengaged. It is instead an illness that afflicts the strong & engaged. I I am going through a depressive episode at the moment & this book was recommended to me by my therapist. It is not a long book but it is packed full of good advice which is easily digested. I am going to re-read a number of its chapters on a regular basis since they are full of good sense. When I was first diagnosed with depression I refused to accept it. Whilst reading a self help book, this book was recommended and I can honestly say I am truly grateful for it. It explains depression so well that when you are a suffering you feel the book was written about you. It’s full of ‘Aha’ moments and it has genuinely changed my outlook on mental illness. And I finally accepted my diagnosis. Would highly recommend also to those struggling with a family member or friend who is dealing with d When I was first diagnosed with depression I refused to accept it. Whilst reading a self help book, this book was recommended and I can honestly say I am truly grateful for it. While I did like this particular doctor's view of depression, I don't think it needed to be 112 pages long. I do trust the insight, Dr. Cantopher has years of experience and seems to be a reputable Doctor, but a lot of the book seemed more like opinion and thoughts rather than researched based. I would say read it, the book is pretty short and I did get some helpful insight. This is an excellent book, gave me a lot to think about. I wish I'd stumbled across it years ago. Recommended by my therapist. Thought I wouldn't get much out of it, but I learned a lot from this book. Thank you! Provide some general information about depression i think. Recommends it for: Anyone who has depression, or knows someone with depression. I read this book in bursts. Every time I picked it up, it presented me with a gift. I feel like I've done myself a huge favour simply for having read it. The author and doctor, Tim Cantopher, has a brilliant no-nonsense voice, and more to the point, that voice comes from a place of sound understanding. Never before have I come across something, or someone for that matter, who could sum up this illness in a way that didn't feel belittling or judgmental. It's usually one or the other. To be perfect I read this book in bursts. Every time I picked it up, it presented me with a gift. I feel like I've done myself a huge favour simply for having read it. The author and doctor, Tim Cantopher, has a brilliant no-nonsense voice, and more to the point, that voice comes from a place of sound understanding. Never before have I come across something, or someone for that matter, who could sum up this illness in a way that didn't feel belittling or judgmental. It's usually one or the other. To be perfectly honest, I've never made it past chapter two in any other self help book for depression. I've found them either too patronising, or lacking any kind of understanding. This man however, this author - I want to write him a damn thank-you letter or something! He really gets it. Really and truly. Every Monday morning starts this way and I refuse to rise until I am running late, but after a while I drag myself grumpily out of bed and start my week. I have never been good at Mondays and it takes a while for my mood to pick up through the day. It isn't that I don't like my job; I do, very much. It is just that I like rest and recreation even more and on a Monday morning the next opportunity for these pleasures seems an awfully long way away. No you haven't, so stop making things worse with your ill-informed advice. If you really want to help, try to understand that sufferer of this illness is going through torment of a pretty awful kind." Anyone who has ever suffered from this illness will appreciate the approach of this book. It allows for reflection and it offers up more advice and support than I could ever have hoped for. If you find yourself faced with well-meaning but desperately clueless folk, or a therapist who pushes you too hard, too soon, or friends and family who want you to 'pull yourself together' - READ THIS. It’s written by a psychiatrist. He makes clear that he is talking about the kind of depression that is ‘stress-related’ (as opposed to bipolar or other types of depression which are part of a person’s chemical make-up), which is to say that it is caused by overloading the system repeatedly until a fuse blows. This is why, he argues, depression affects the strong, not the weak – for it is they who constantly take on the burdens of others as well as themselves, until their body snaps and they dev It’s written by a psychiatrist. He makes clear that he is talking about the kind of depression that is ‘stress-related’ (as opposed to bipolar or other types of depression which are part of a person’s chemical make-up), which is to say that it is caused by overloading the system repeatedly until a fuse blows. This is why, he argues, depression affects the strong, not the weak – for it is they who constantly take on the burdens of others as well as themselves, until their body snaps and they develop a depressive illness. He is very helpful at striking the balance in describing depression as a physical condition, which is not your fault, whilst at the same time offering suggestions of lifestyle changes you can make to give your body the best chance it can have to heal. Obviously, it is just one person’s philosophy about depression and its causes and cures, so should be treated as such, but I found it very helpful. There are very few audiobooks that I ever fail to complete, but Tim Cantopher's "Depressive Illness" has set a new bar for me. I lay the blame equally at the feet of the author and the narrator. As other reviewers have mentioned, Lynsey Frost is a strange and inappropriate choice. Her tone is patronising, cloyingly familiar and just plain infuriating. For some reason, the audiobook version altered the text to be in the third person ("Dr. Cantopher thinks ...") and this got old really fast. But even with a different narrator, this would still be an annoying and pointless book. The author's own arrogance - self-admitted in the text no less! - shines through. I'm partial to the Dr's ideas of self-treatment, but that is such a small part of this book. The rest is stated so unequivocally - particularly the science of depression - and yet so many of his unassailable "facts" are contentious at best, and plain wrong at worst. For anyone suffering from stress or depression THIS is the book to read. I was fortunate to have been recommended this book by a good friend who himself has suffered from clinical depression and who knows me well. Not only does this book explain that clinical depression is a very real, physical condition, but it gave me a very clear understanding and offered a number of techniques in which to treat it and prevent it from happening again. I'm still struggling, but with the help of this book and som For anyone suffering from stress or depression THIS is the book to read. I'm still struggling, but with the help of this book and some insight, I hope to not only get through this depression, but come out of the situation stronger and in a better place and with a mindset that will prevent me from ever getting into this position again. For anyone suffering depression this is a good read, you will begin to recognise all the symptoms as if the book was written about you! If you have suffered depression this is a difficult read. Some sections are hard going but stick with and all will become clear, The Curse Of The Strong.......will make sense, you're not a failure (right now you think you are) in fact, as the book points out, you are very strong you just need to learn how to strike the work life balance and learn to say no to ot For anyone suffering depression this is a good read, you will begin to recognise all the symptoms as if the book was written about you! If you have suffered depression this is a difficult read. Some sections are hard going but stick with and all will become clear, The Curse Of The Strong.......will make sense, you're not a failure (right now you think you are) in fact, as the book points out, you are very strong you just need to learn how to strike the work life balance and learn to say no to others! I have suffered from depression for at least four years and really related to this book which was recommended by my doctor. I saw how I had been pulled into this mess and learned a lot about the science and psychology. I'm still trying to find the route out that works for me. I believe that everyone who has depression or knows someone else who does should read this book.